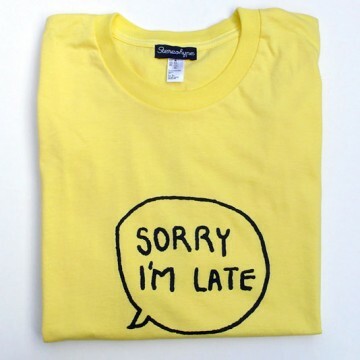 Sorry I'm Late was originally designed by Richard J. Kirk for his Stereohype B.I.O. (By Invitation Only) Button Badge Series 2 contribution. One of Stereohype's most consistantly popular button badges it is really about time we made the T-shirt. The Sorry I'm Late button badge was also one of the hand-picked designs selected for themed button badge sets Stereohype manufactured for its partner Habitat (see flat33.com for more info). Comes with a free Sorry I'm Late button badge.